China has grown in strength economically, financially and militarily. It has been eating up global gold mine supply for about 10 years. It has 20,000 tons or more compared to the supposed 8,133 tons held by the US. The announcement of yuan for oil, convertible into gold, is a game changer. China consumes more oil (in dollar terms) than all the gold produced in the world. At current pricing, China uses more oil than the entire world produces money. Over the last few years, China has imported roughly 2,000 tons of gold annually. China and India are importing more than the 2,500 tons that are produced. It can only come from Western vaults. In order to pretend their financial systems and currencies are sound, the West (led by the US) has been selling their gold reserves. If China imports oil and pays with yuan and offers their yuan convertible to gold, how many oil producers will take them up on the conversion? How long can China and India import more than the world produces? Where will demand be satisfied if oil producers’ newly acquired yuan are converted to gold? The answer is they cannot …at current prices. China watched as the US was bled dry of gold leading up to 1971, and ever since. It understands the game. It is leading the world toward a gold standard by diverting what was previously oil for dollars into oil for gold. By making yuan convertible into gold, China is creating a demand they know cannot be met by supply at current prices. Why? —China is the largest gold owner on earth so it is marking the value of its treasury up by multiples. A higher gold price will make it difficult for other nations to accumulate gold. By freeing the gold price, China is assuring its place as a world financial leader. —China will be devaluing the yuan versus gold, which will have many benefits. —Moving the world to a gold standard means moving away from the dollar. —This scheme avoids the Bretton Woods pitfall: Bleeding out treasury gold. The question being raised by some well-regarded China watchers such as Koos Jansen is: where is the evidence that China intends to embark on this oil-for-yuan scheme? All we have is an unsourced article in the Asian Nikkei Review and according to Rory Hall at the Daily Coin and others the author has already admitted the article was speculation. Meanwhile, the alternative media is reacting as if it were a fait accompli. Has anyone seen any authoritative Chinese statement on the scheme? Sorry for our delay in responding but we too, are seeking hard data on this. As of yet, there has been no official statement from the Chinese government that an oil for yuan for gold contract is yet live or even supported by the state or an approved institution. The growing Shanghai Futures Exchange documents give little indication of the currency swap arrangements. However, it would be a very clever way to further incentivize oil exporters to accept Yuan if it had a gold component. Confidence in the Yuan is growing, and has been doubling nearly every other year. Speculation is that this would likely appeal most to Russia, Iran and Venezuela as none of these countries are keen on supporting the USD and want to diversify away from the dollar. Other countries will follow suit in time. There is no question that the Chinese want to further internationalize their currency. It was key for their acceptance into the IMF’s Special Drawing Rights. We do know China is currently negotiating the terms for an equity deal with Saudi’s Aramco. There are implications here that the Yuan could be part of that deal, but no hard evidence regarding this as the talks are still ongoing. As China further establishes currency swap arrangements with other countries, the Yuan will gain greater acceptance. In spite of China’s massive growth in the last many years, the Yuan is still only the 6th most used currency, behind Canada even, at ~1.6% (according to SWIFT data). The USD represents ~43% of all global trade settlement so the Yuan has a long way to go before it dethrones the USD as the primary reserve currency. It will likely happen sometime in the future, but it won’t likely be this year. Interesting argument except that China has repeatedly stated that no gold leaves the main land. How does that benefit the oil producer? That is correct; no Chinese gold legally leaves the main land. That is why the Shanghai Gold Exchange was established in the equivalent of ‘International Waters’ or an ‘International Airport’. This was done to bypass the restrictive rules for domestic consumption. The SGE allowed China much greater access to international gold markets. The Chinese government wants greater global acceptance of its currency and is growing its use at a rapid pace. However, we suspect that they want it to grow even faster for a number of reasons – not the least of which is to diversify out of some of their USD holdings. In a rising gold price environment, oil exporters would be smart to accept at least a portion of their oil sales in gold swap arrangements as it would boost their returns and hedge their risk to the Yuan. With that being said, the Yuan is tightly pegged to the USD (50bps up or down) so it isn’t the USD:Yuan they are likely hedging but the possibility of a change in the peg. Oil producers could easily accept payment in a variety of currencies. They possibility of a swap arrangement reflecting the SDR composition, with a gold allocation, is also something that is likely being examined. Just like all exporters, reducing Fx risk through hedging and swap arrangements is nothing new. All major exporters hedge currency risk. This could benefit the oil producers by further diversifying the payment methods while simultaneously giving them an easy way to profit from a rising gold environment. 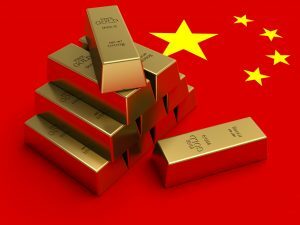 Given the dramatic decline in annual gold production numbers expected in the coming years, we think it would be a smart play for anyone selling anything to the Chinese.